This is by far the best CD in the Punk-O-Rama collection. Although it lacks the variety of artists that can be found in other CD's in the collection, but what it lacks in quantity it makes up in quality. A lot of the artists on the CD have multiple tracks on the album. 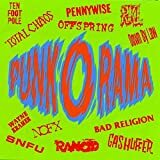 Punk-O-Rama is a great look at early 90's punk rock, back before pop punk became popular and alot of these artists became mainstream. The first song is by Bad Religion, the posterboys of Epitaph Records. I don't particularly like Bad Religion, but they are a good band and they chose a good song for the album. Other artists with particularly good tracks on the CD are NOFX and The Offspring. Although the Offspring have succombed to the masses and gone mainstream, their early work is a lot diffrent and I like it. If you like punk rock but your sick of listening to crap by Good Charlotte and Blink 182, you'll probably like this CD.